Remember that hissing, growling, short-tempered dust tornado from those old cartoons? That whirling dervish of madness was a Tasmanian devil, and he probably came from the city of Hobart, the capital of Tasmania. Aside from these excited little rascals, this big island is home to exciting adventures, friendly locals and tasty wine. But none of this is possible unless you book one of our great hotels in Hobart. They’re only a few clicks of the mouse away, so what are you waiting for? How do I get to Hobart from the airport? Your flight to this wild island will land at Hobart International Airport (HBA), 17km from the downtown area. There’s all sorts of ways to get to the city centre and your Hobart accommodation. Take a taxi, book a private shuttle or jump into one of our car hire deals. Take your pick and get going. 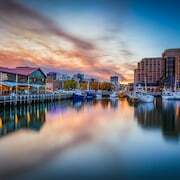 What are the most popular hotels in Hobart? What kinds of hotels are in Hobart? 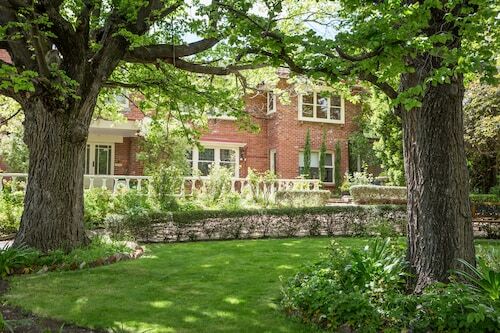 Are you looking for luxury accommodation in Hobart? No problem. What about apartment hotels? Yup. And boutique ones? Of course. Check out the sweet digs below to get some ideas. Hotel Grand Chancellor: Located on the scenic waterfront, this place is luxury personified. If you like to start out your morning by working up a sweat, pump out some reps in the state-of-the-art gym. After your workout, go for a dip in the pool. There’s also a great on-site bar and restaurant where you can order a grilled kangaroo steak accompanied by a bottle of wine from one of the local vineyards. The Old Woolstore Apartment Hotel: If you want to feel like you never left home, this is the place for you. You can choose anything from studio apartments to executive spa apartments that are located on the top floor of the hotel. Don’t you want a room with a view? The Henry Jones Art Hotel: The name doesn’t lie; this really is an art hotel. The walls of the lobby and the rooms and hallways are lined with stunning pieces of contemporary Tasman art. There are also a few places on-site to wine and dine. Where should I stay if I’m visiting Hobart? This city may be small when compared to other Aussie metro areas, but that doesn’t mean it lacks cool and quaint neighbourhoods. North Hobart is home to a restaurant row that will crush your appetite. In Salamanca Square you’ve got the massive Salamanca Market. And let’s not forget about West Hobart, where there’s a Chinese market that looks like it came straight from Shanghai. Yes—this is where you can spend some of the money you saved on our Hobart packages! What are some things to do in Hobart? Tasmania is a rough and wild land full of adventure, and our Hobart hotels are the perfect launching points for your adventures. Time to get started! Mount Wellington: The summit of the Wellington Range rises directly behind the city and offers unbelievable views of the Tasman capital. Take a bus to the Fern Tree and then make your way up a steep switch-back to the top. Be prepared to take around a hundred Instagram photos. If walking to the top doesn’t interest you, just stay in the bus and ride the rest of the way. It’s your trip! Queens Domain: This is a small bushland area along the Derwent River where the Government House and Royal Tasmanian Botanical Gardens are located. The gardens are a perfect place to wander and clear your mind. Wine tours: The hills surrounding Hobart are littered with wineries, and you’d be a fool not to sample their goods. Hop on a tour and stop off at places like the Charles Reuben Estate, Coal Valley Vineyard and Meadowbank Estate. Reds and whites all day! 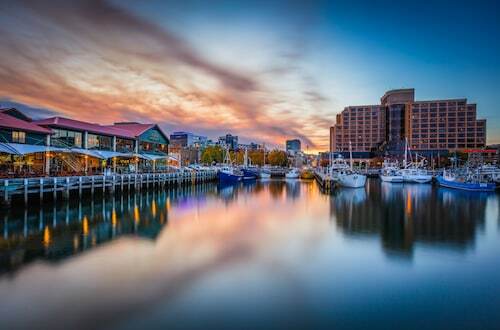 Now that you know where to go, what to do and where to stay, all that’s left is for you to go to Tasmania. With the money you saved from Wotif’s Hobart hotel deals, you’ll be able to buy all the excellent wine you want. And hey, you probably saved enough to make a five-hour flight north—our Cairns accommodation is waiting for you. Go ahead—extend that holiday! How Much is a Hotel Room in Hobart? Hotels in Hobart start at AU$72 per night. Prices and availability subject to change. Additional terms may apply. Lovely room with a view, great laundry but you need gold coins,kitchen facility a little small but still a very comfortable stay .Close to the restaurants a great place to stay with helpful friendly staff.